When the Utah State men’s basketball team’s season seemed certain to crumble, coaches didn’t ask it of him. His motivation was stirred in a Denver hotel room in mid-January, he could take center stage in salvaging his team’s season. There was sufficient talent still within the Aggies’ eight-man rotation, after all, to make it worth it. Spencer Butterfield has since emerged from the Mile High City as an all-conference WAC player and a member of the conference’s all-newcomer team. He did it by increasing his scoring average by more than six points and five-and-a-half rebounds per game since then—the highest increase in both categories on his team—though his increase in minutes per game (9.2) are hardly tied for third. With the losses of preseason all-conference players Preston Medlin and Kyisean Reed to injuries the weekend USU was hammered at Denver, Butterfield—much as he has done in creating one-man fast breaks this season—saw daylight. “There was an opportunity to be taken advantage of,” Butterfield said. “Just sitting in the hotel, I thought that we still had some good weapons. I didn’t that to go to waste. I wanted to take that responsibility. As is his connection to his school, his conference and the people who appreciate him after arriving at USU in the summer as the 2012 California Junior College Co-Player of the Year. Butterfield was born in Provo, Utah, and grew up in a quiet California town he said is all too much like Cache Valley. He appreciates the outdoors, staying active and working on cars. Spirituality is a central role in his life. And he funnels all of it to part of his success in keeping USU afloat, helping the program join just a handful of other schools in winning 21-plus games for the 14th straight season. Hours after a double-digit loss Jan. 17 at New Mexico State, Reed was declared out for the year in needing surgery to repair his torn ACL. With a fractured wrist, Medlin was declared out 6-to-8 weeks and is questionable for a possible return for the WAC Tournament. Though the Aggies have gone just 7-7 since then, four have come by two possessions or less, including two buzzer-beating defeats in five days. And Butterfield has at least helped USU remain its edge in its most dominant category before the injuries: the Aggies have outrebounded their opponents in each of those games. USU also remains fourth in the NCAA in rebound margin. Perhaps that’s the greatest achievement in Butterfield’s buoying efforts. Five days after sitting out a 15-point loss to UT-Arlington due to a hip injury sustained two days earlier at Louisiana Tech, the Yuba Community College transfer grabbed 20 rebounds in a March 7 win over Texas State. 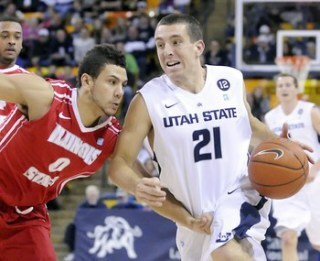 It marked the fifth-highest total in the nation this season and the highest by any USU player since 1997. His knack to rebound doesn’t come with any particular trick, he said. Butterfield even apologized for not having a clear answer to whether he has a particular strategy to maneuvering his smaller-than-average frame, for the Div. I level. How about having an extra step in general, then? He created some half-dozen one man fast breaks in a buzzer-beating loss at BYU on Feb. 19, let alone several other times this season. Yuba Community College head coach Doug Cornelius attested that was also the case in Butterfield’s first two years of college, when he arrived on campus from Loomis, Calif., about 20 miles north of Sacramento. When Butterfield committed to USU, Cornelius said he didn’t doubt Butterfield would continue to excel at the Div. I level. Even USU coach Stew Morrill, who has often been quick to describe the importance of team effort, acknowledged recently that the team’s confidence is markedly different with Butterfield. Morrill and the Aggies saw that firsthand in the March 2 loss to UT-Arlington. Such swagger would needed, he added, heading into a WAC Tournament headed by a Louisiana Tech team that had been ranked and featuring three teams on USU’s side of the bracket that won both regular-season contests against the Aggies. Butterfield would say it’s often because he makes it skyward. He attributed his success to his faith in God. His spiritual upbringing has specific root. Though he was born in Utah County, Butterfield was moved as a child to Loomis, where his grandparents live. As a town of 6,000 people, Butterfield felt at home being driven down historic Main Street in Logan during his recruiting visit. He appreciated that the community rallied behind local school football and basketball games, his two favorite sports (he acknowledged that his experience as a former safety and receiver may help his headiness for rebounds). He has appreciated the “genuine” nature of Cache Valley residents. Certainly, however, Butterfield’s greatest draw to USU was because of the winning basketball tradition that Morrill, the coach recently said mildly, has “added to a little bit.” Butterfield had gained familiarity to massively successful programs at Yuba CC, which has won seven consecutive Bay Valley Conference titles. The 49ers also boast a 72-3 record since the 2008-09 season. A legitimate opportunity to play in the NCAA Tournament—a lifelong dream— ultimately beckoned Butterfield. Someday, he may working on cars, a real passion of his. Teammate Ben Clifford says he talks about it all the time. But that is far from focus now. Butterfield said a unique brotherhood has formed because of the unconventional injuries to his team, motivating them to accomplish Butterfield’s primary basketball dream. Though he admitted it’s been more difficult because of his hip injury, Butterfield has often headed back to the Spectrum at nights in order to take more shots with his brother Taylor, a freshman at USU. Given his response, you’d think he probably is as authentic as the Logan residents he appreciates.